Adrianza, a switch hitter, is limited to hitting left handed as he recovers from offseason shoulder surgery, the Minneapolis Star Tribune reports. He batted leadoff and played third base in a split squad game Saturday, going 0-for-2. "I don't know how long it's going to be, but I have to follow the [recovery] protocol. ... 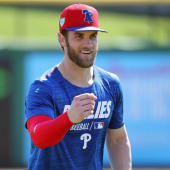 I'll switch-hit again, later in the season," he said. Adrianza underwent surgery in October to repair a badly torn rotator cuff in his left shoulder. It was thought he would need six months to recover, so it's encouraging to see him play in the first spring game even with his limitation at the plate. However, the injury and the signing of versatile Marwin Gonzalez could severely limit his playing time off the bench.